(PhysOrg.com) -- Mouseless is a computer mouse that allows you to interact with a computer with a mouse in the same way as usual - except that there is no mouse hardware. The researchers call it an "invisible mouse." A group of scientists working with the Fluid Interfaces Group at the Massachusetts Institute of Technology (MIT) Media Lab in Cambridge Massachusetts, were interested in removing the requirement for a physical mouse, while still allowing computer users to interact with their computers in a way with which they were familiar. 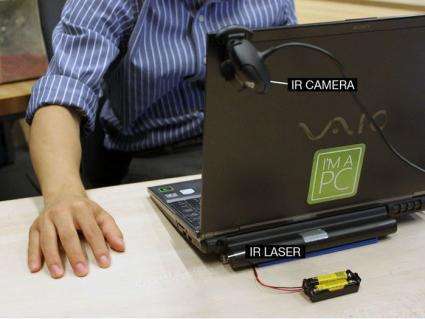 The researchers, Pranav Mistry, Liyan Chang, and Pattie Maes, developed an infrared (IR) laser beam and associated camera that could be incorporated into the computer so that a plane of IR laser would be created just above the surface on which the computer is resting. The user acts as though a physical mouse were present and the laser beam is intersected by the hand, and parts of the hand are shown up as bright spots of light that change position as the hand moves. The built-in camera then interprets the changes in position of the hand and fingers and translates them as moves of the mouse and clicks on the two buttons, and the cursor on the screen moves as if the user was operating a physical mouse. Mouseless is an invisible computer mouse. There are no plans for commercializing the "invisible mouse," but the prototype Mouseless was built for around $20 USD. The MIT group of researchers are now working on improvements to the recognition and tracking algorithms with the aim of building up an expanded command library. This may in the future lead to more complex gesture recognition than is possible at present, and could ultimately give the Mouseless a number of advantages over a physical mouse, since the number of functions handled by a physical mouse is limited. The MIT Media Lab’s Fluid Interfaces group works on ways of integrating the world of digital information and services more naturally into our normal lives, by designing intuitive and intelligent interfaces. Pranav Mistry is a PhD student and research assistant at MIT Media Lab. His project “SixthSense” won the Popular Science Invention of the Year award in 2009. I can't see this ever being accurate enough. For most people maybe, but for someone who is fast on a PC, you will NEVER replace a good mouse and keyboard. Only a direct brain interface has that potential. I do think people would buy this though if it was commercialized. How do you click and drag? ... Gotcha. I have a seven button mouse, and use six of those buttons constantly (the regular three buttons, plus copy, cut, and paste). Are they going to reproduce that? Also, there were non-physical laser keyboards at one point, and those obviously didn't catch on. I don't think this would be any different. It looks like every "click" is a double tap of the finger. So I'd imagine a drag would be a single tap of the finger, until there's another single tap. You know before the web - almost everyone used double clicking - and outside of a browser you have to double click to do everything except changing context. it would seem the click drag is safe -- this is implemented in the OS. the click on the border gives the border context, written into the program that describes border windows ( in windows everything on the screen except text is technically a window and they all have slightly different rules -- this is hidden from the user but programmers are aware of the difference) -- anyway clicking on a border to drag, once the initial click down is detected you enter a new part of the program that allows you to resize until a release of the mouse button is detected. This is just a working prototype I wouldn;t expect that to be addressed at this stage but looks highly feasible. this will probably not cut into anyones bottom line as hardware that has to move tends to be expensive to engineer. This is a sensor with software. It looks a bit laggy in the video, though maybe it is just the recording. Also, the camera & laser would need to be MUCH smaller for this to be marketable. And unlike a wireless mouse that can go anywhere (including switching to other side for lefties), this can only be used in a fairly small section to the right of the laptop. there is something there though.... if they can package it better and improve the software so that it becomes more accurate... i think they got a winner... ont surpised if apple gets to it in the near future!
" This may in the future lead to more complex gesture recognition than is possible at present, and could ultimately give the Mouseless a number of advantages over a physical mouse, since the number of functions handled by a physical mouse is limited." I think once the research hits this point it will be much more commercially viable. Cool concept though. Mouseless mouse? Last three laptops I've owned have had mouseless mouses, they call it a touchpad, and it's already multi-gesture capable. For the type of work I do on a computer I'd still rather have a multi-gesture capable 24" LCD, or better still, as others have mentioned, neural input. I can no longer live without the scroll wheel. I suppose you could try to approximate that with middle finger gestures. Responsiveness and accuracy would be the key here. I think the camera better be faster than 30fps. More like 100fps. 1. Humans need a certain amount of tactile feed-back. I guess there is some from the desktop surface, but I'm not sure if that is enough to make it feel natural enough. 2. Once they get to the point where is can detect more sophisticated hand gestures, then it might work. 3. Move the camera around in front of the monitor, and turn the laser into a 3-d grid and you could have the old-school VR-type interface without the gloves. But as-is, I don't see people buying into it. Seems like the cursor was floating about even when the hand changed direction. Touch screen is the only alternative until we just have a neurological interface. OK - so why didn't the video camera shooting the YouTube video pick up the IR light? Because that camera isn't designed to pick up that part of the spectrum. Some cameras will be able to detect infrared in black and white mode. I really have to laugh when they try and take an input device and SHAZAM make it better! All they are doing is substituting a table surface for the mouse. The table does not move like the mouse so you get that wonderful sensation, there is nothing revolutionary about how you tell it what you want to do, you do exactly the same basic thing you do with.. gasp, existing mice. My physical mouse is set so sensitive I do not move my hand for some operations, merely flex my fingers. I too am skeptical for the accuracy and lack of anything tactile. Then there is one quality of the 'traditional' mouse that many attempts to 'better' it fail on, I can lift my hand away from the physical mouse and leave the pointer to be still in one place. I can also lift the mouse to 'reset' the relative location on the table - distinguishing it from a tablet device.